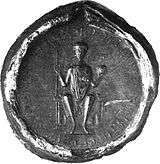 Lothair II or Lothair III[lower-alpha 1] (before 9 June 1075 – 4 December 1137), known as Lothair of Supplinburg, was Holy Roman Emperor from 1133 until his death. He was appointed Duke of Saxony in 1106 and elected King of Germany in 1125 before being crowned emperor in Rome. The son of the Saxon count Gebhard of Supplinburg, his reign was troubled by the constant intriguing of the Hohenstaufens, Duke Frederick II of Swabia and Duke Conrad of Franconia. 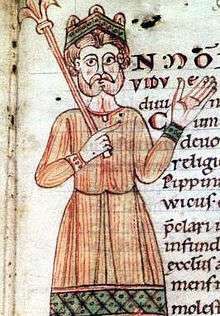 He died while returning from a successful campaign against the Norman Kingdom of Sicily. In 1013, one Saxon noble named Liutger was mentioned as a count in the Harzgau subdivision of Eastphalia. 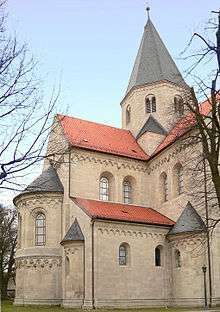 His grandson Count Gebhard, father of Emperor Lothair, possibly acquired the castle of Süpplingenburg about 1060 by his marriage with Hedwig, a daughter of the Bavarian count Frederick of Formbach and his wife Gertrud, herself a descendant of the Saxon margrave Dietrich of Haldensleben who secondly married the Billung duke Ordulf of Saxony upon Count Frederick's death. 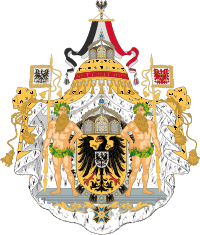 ↑ He was the second emperor named Lothair, but is numbered "Lothair III" by those who count as his predecessor Lothair II, most of whose kingdom became a part of Germany. Other sources number him "Lothair III" because he was the third Lothair to rule Italy after King Lothair II of Italy. Lothair occasionally called himself "the third" in his diplomas (Lotharius tertius), and was the first German ruler to abandon any distinction in numbering between his rule as king and his rule as emperor, a practice continued by his successor. 1 2 Lodovico Antonio Muratori, Tavole cronologiche de'consoli ordinarj, papi, imperadori, re de' Romani, re d'Italia, prefetti di Roma, dogi di Venezia, e di Genova, de' quali si fa menzione negl' Annali d'Italia dal principio dell' era volgare sino all' anno MDCCL (Rome: 1788), 78–81. ↑ John B. Freed, Frederick Barbarossa: The Prince and the Myth (Yale University Press, 2016), p. 56; see, e.g., this diploma of 20 November 1125. ↑ Philip Grierson, Mark A. S. Blackburn and Lucia Travaini, Medieval European Coinage. Vol. 14: Italy (III) (South Italy, Sicily, Sardinia) (Cambridge University Press, 1998), pp. 125–26. The coins are of two types, probably because the traditional date for "renovating" the coinage (29 September, Michaelmas) fell during the occupation. ↑ J. L. Bada, B. Herrmann, I. L. Payan and E. H. Man (1989), "Amino acid racemization in bone and the boiling of the German Emperor Lothar I", Applied Geochemistry 4: 325–27. Canduci, Alexander (2010). Triumph and Tragedy: The Rise and Fall of Rome's Immortal Emperors. Pier 9. ISBN 9781741965988. Pavlac, Brian A. (2001). "Lothar III (1075–1137)". In Jeep, John M. Medieval Germany. Routledge. pp. 470–71.